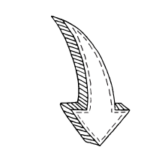 *We use affiliate links in our posts. You can read our disclosure policy here. 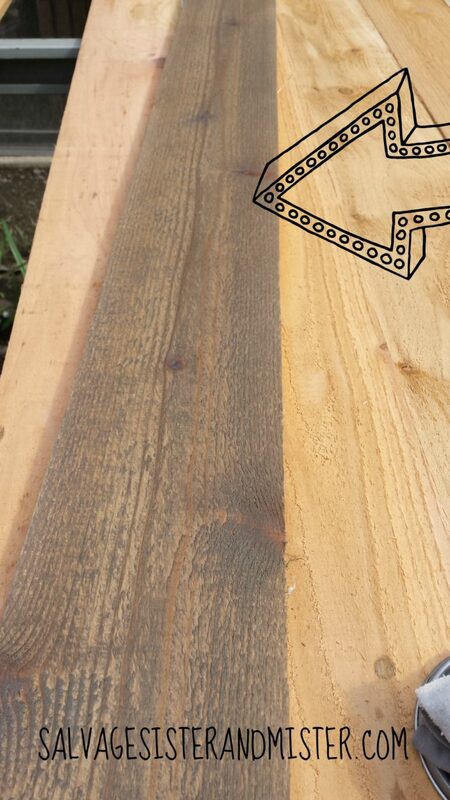 We make no apologies for loving RECLAIMED WOOD! You can see 6 reclaimed wood projects HERE. There is one problem. If your fence doesn’t blow down, or you don’t have connections to obtaining free reclaimed wood, it can get EXPENSIVE!!!!!!!!!!! We apparently aren’t alone in the reclaimed wood love! What’s a salvagesister and a mister to do? We looked into a peel and stick method, which has great reviews, however the price was not in our budget. If the reclaimed wood doesn’t come to you, you go to the reclaimed wood. At your local hardware shop we purchased 1 x 6 cedar fence posts 5 ft long. Cost $1.74 each …BARGAIN ALERT!!! Next stain them using an old rag or t-shirt. *Don’t forget to stain in a well ventilated area with gloves on. We found the Minwax stains we used with our partner Amazon…. HERE and HERE, or use any colors that you like. Stain is aprox $8-10 a can. After aprox. 20 boards- 3/4 can of the weathered oak and 1/4 classic gray was used. Only one side plus one end and bottom edge were stained since we will be doing a wall. 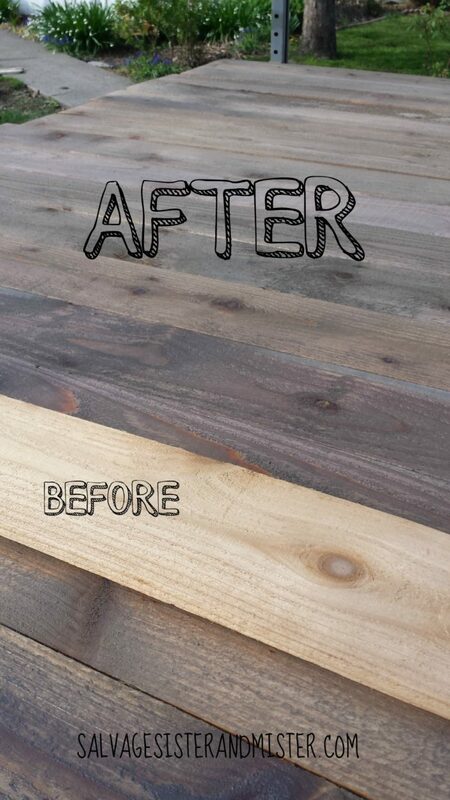 You will use more stain if you need to do both sides on the wood for your project. We alternated between applying the two stains with no real pattern as we wanted the wood to all be different. It took about one to two hours to complete all the boards. 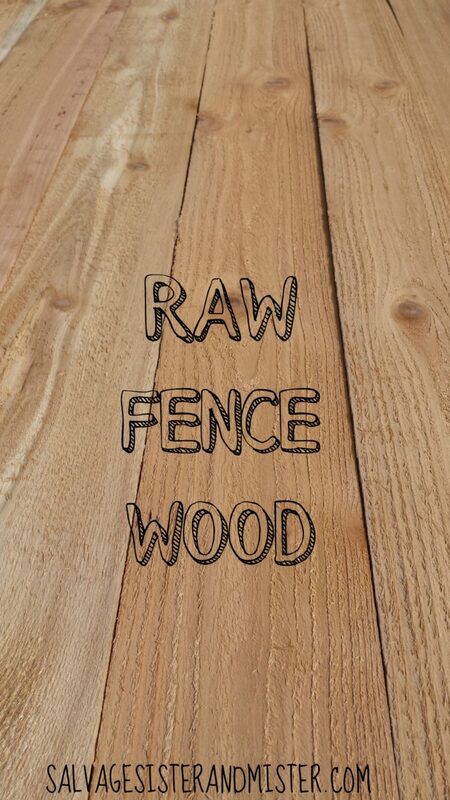 We understand this is not true reclaimed wood. It’s just our version for our wall. For just about $50 we have around 40 sq. ft. of DIY reclaimed wood. 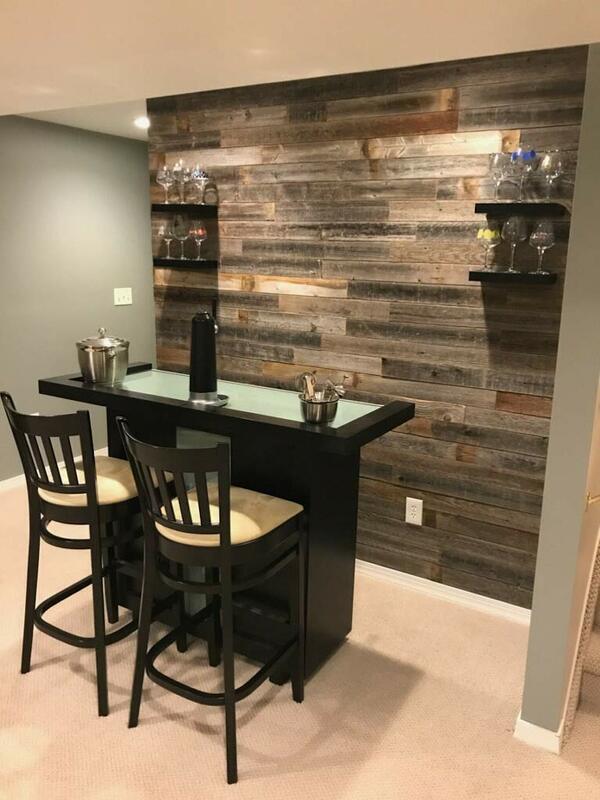 What would you make using this DIY reclaimed wood? Of course, if you have access to the real deal, we are big believers in “saving” wood. But if you love the look, and not the price, this is a great and very inexpensive alternative. DID YOU SEE OUR WOOD QUILT? Great project, and the idea of making signs is right up my alley! Thanks for the periscope this morning LOVED! Will use these and my Cricut Explore to make signs for sure! That’s great Linda! Please share (or tag) when you do one!!! I am getting ready to do my first DIY project with this type of wood! I’m nervous since its a big important one, but hey, go big right!! My husband is a builder so getting it done is up our alley. However, his specialty is new modern homes and hasn’t done this technique. I want to redo our kitchen countertops in this style. Any tips for finished surface to be cleanable, wipeable? I know some clear top coats can leave a white mark with even a bit spoon set on it from stirring coffee. So I want to do this but need finished wood to be durable for kitchen use, we have a large family with kids so it will get a Lot of use! Wow, that is definitely NOT reclaimed wood. Please don’t fool people like this. Joe, This is NOT to fool people. Reclaimed wood in our area is very expensive. 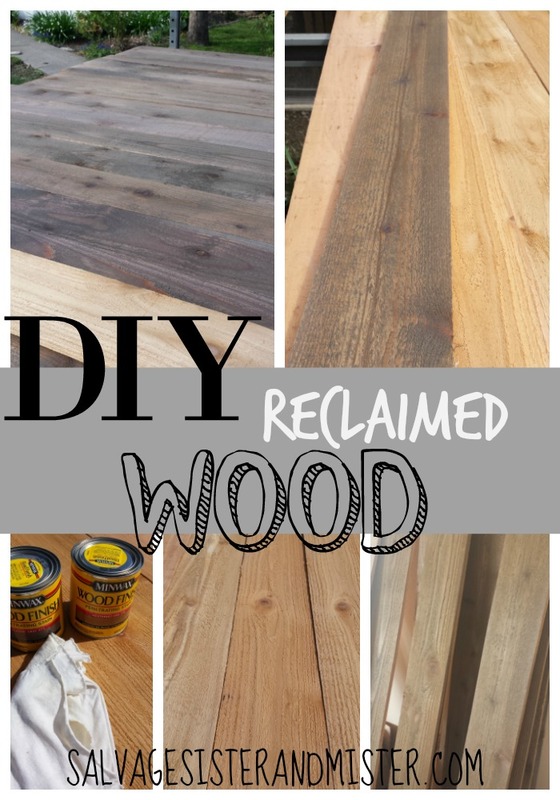 Since the only way to get reclaimed wood is to buy it no one would ever come to a DIY project and expect to see DIY “Reclaimed” wood tutorial – Go to the store and buy it. This is an alternative CHOICE. If it’s not for you, totally good with that. Please be kind on this page though. We understand that not everyone will like what we do, but kindness is always a good way to go to get your point across. Thank you very much for posting the tutorial. It was very helpful as I can attest that reclaimed wood is often exspensive. My only question was the 3/4 to 1/4 stain ratio that you mentioned. Did you mean that you mix the two stains together initially or you apply them separately onto the wood? Ezra, I did apply the stains in separately. Wow, I have a few spaces in my home that I would love to use reclaimed wood. I love the weathered look you did here. so did you mix the 2 stains together or did you just alternate boards? the 3/4 and 1/4 threw me off. Hi Lance, I am so sorry for the confusion. I just did one stain and immediately did another stain on top. Hope that helps. Were you using the wood indoors and if so did you treat it for wood worm? I’ve been looking into using rough sawn fence wood inside and concerned about wood worm and whether I’d need to treat it. Great article it’s exactly what I’m looking to achieve as alternative to pallets. 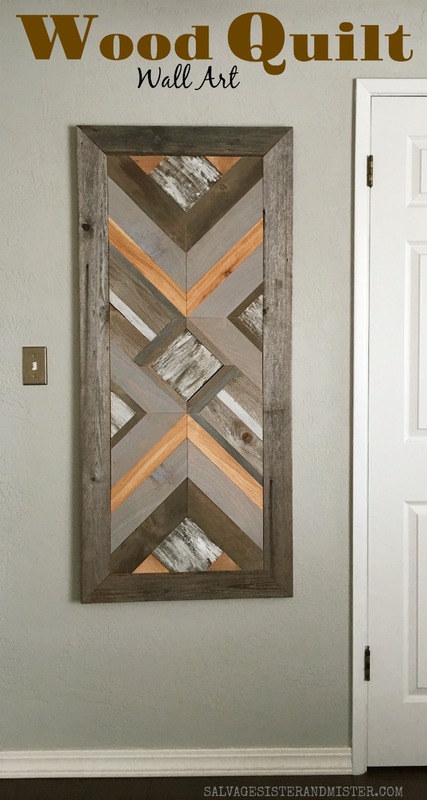 I love this, BUt I Iam sorry to ask this again, but did you layer the stains on top of each other on each board or are they stained one gray one oak? If you layered did you stain the entire board with both colors or justkind of paint it on on different sections of the wood. Also did you wipe off or just let the min wax soak in. Thanks!! Not a problem at all. I just opened both cans and dipped the scrap cloth in a little of each. Does that help?